Where are we located in Quebec? The Mecaglisse complex is located at Notre-Dame-de-la-Merci, in the Lanaudiere region. We are a 15 minutes drive from the village of St-Donat and a 50 minutes drive from the ski resort and touristic centre of Tremblant. Why have we chosen this region? Our location ensures undeniable advantages when it comes to temperatures. Notre-Dame-de-la-Merci benefits from heavy and constant snowfalls in winter. The difference of temperatures with Montreal is usually about 5 degrees, which means that we, most of the time, get snow when it rains in Montreal. Therefore, we are able to offer you ideal climatic conditions (snow and ice) for major winter events (for ex. tires’ or automotive launches and tests). We wanted to make sure that we remain at reasonable driving distances from big cities (90 minutes drive only from Montreal) and touristic areas (50 minutes drive from Tremblant) but far enough to avoid noise disturbances. You will be blown away by the setting: we are surrounded by a wonderful domain spreading across 700 acres of trees and forests! 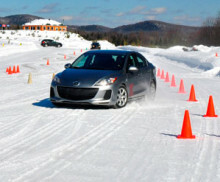 Are the Winter driving Course and Rally Course open to single participants? Yes, you do not need to be part of a group to participate in those courses. It is our role to bring together enough participants for the selected dates on our calendar. When is the Rally Course taking place? If I decide to use my own vehicle for the Rally Course, does it have to be fitted with a “roll-cage”? The “roll-cage” is not compulsory for the course. However, for the summer course, we strongly advise you to use one of our own vehicles, because of the gravels, which might damage the paint on your car. A “roll-cage” is only needed during the rally courses organized by championship pilots, in the forest. In the information given on our website about the Rally Course, it is stated that participants will be instructed in teams of two. If I bring my own vehicle, will the other participant use it? No, if you bring your own vehicle, you will be the only driver. Instructions will be given to you in alternation: either you will be driving your own vehicle or be a passenger in another participant’s vehicle. Are there any risk using my own vehicle for your Winter driving course? The Winter driving Course has been designed so that normal everyday vehicles can be used. 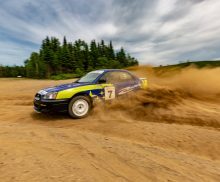 When it comes to the Rally Course however, it is necessary to own a manual transmission, essential for learning advances driving techniques. Whatever the winter course you go for, exercises are taking place on large portions of the track, where we lay out cones, which will not damage your vehicle. Is driving on snow/ice less demanding for the brakes and is the wear-out of the tires reduced compared to a summer course? Yes, brakes will be used a lot less in winter (except on FWD, which requires braking with the left foot) and clearing of the heat is better. Is the main pre-requisite to have good winter tires, not too worn-out – power and a sportive suspension not being essential – to have the best experience? Yes. The state of your tires is very important compared to the power of your vehicle (to improve traction, braking and lateral grip in turns). The course is about driving techniques. It is therefore the chassis and not the engine which are mostly “at work”. When it comes to suspension, vehicles with mobile suspensions work better with mass transfers. 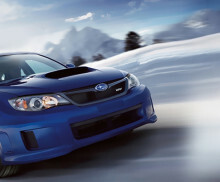 FWD, RWD or AWD: what is more fun when taking the Rally Course? There is so much to learn in winter and each vehicle has their subtleties: in FWD, you can work on braking with your left foot, in RWD you can work on blocking the gearbox for example. Some techniques such as the pendulum turn are the same for all vehicles, whether AWD, FWD or RWD. In the end, the vehicle you use does not matter, it is foremost a school of modesty! Do I need to equip my two-wheel drive vehicle with studded tires for the course? No, it is not necessary but it is a plus for a lapping day on ice as the surface will become more and more slippery as the day goes. Which course should I follow to obtain a rally license? Our Rally Course is recognized by the “RSQ” Federation to obtain a basic rally license. 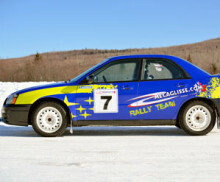 With this license, you can participate into rally-cross and performance rally competitions. Do I need to be part of a club to register for the summer/winter “lapping” courses? No. We organize those courses and no club membership is required. What norms are required for helmets for “lapping courses”? Snell 2005 and more or DOT. Open face or full face accepted. Is another passenger allowed in the car during the “lapping“courses? One passenger per session is allowed on each vehicle. But this passenger must have previously signed the waiver and have paid the CAN$15 civil liability insurance fee before boarding the vehicle. Are “Drift” practices allowed on asphalt tracks? Do I need to go on one of yours courses before taking part into a winter/summer lapping Days? It is not necessary but, but we strongly advise you to do so, if you want to get more out of the experience and a better control of your vehicle. Is the “Sport Bike” riding course recognized to take part in races? Yes, this course will enable you to take part in provincial championship races with organizations such as R.A.C.E or ASM. Is wearing a leather suit compulsory for the “Sport Bike” riding courses? 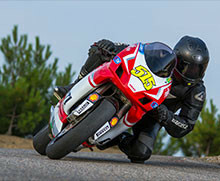 Wearing a leather suit (one or two pieces with zip) is strongly recommended for our courses and track days. Nevertheless, other clothing designed specifically for motorcycle (Kevlar, Cordura…) will be accepted provided it can be zipped at 360degrees between the jacket and pants. Also, each item of clothing has to have padding for the knees, elbows and shoulders. We advise you to wear a back protector as well. What will happen should weather/tracks conditions prevent the course from taking place? If we are not able to go ahead with the course due to exceptional reasons, we will give you a new date. No refund granted. What will happen should it rain on the day of the track days? We will maintain the course. No refund granted. What experience do I need to take a Sport Bike or Supermoto riding Course? Our bikes courses suit participants with all levels of experiences. Whether a beginner or a well experienced driver, our instructors will assess and adapt to your needs, in order to give you the best training. Do I need to go on a course before taking part into the track days? It is not necessary but, but we strongly advise you to do so, if you want to get more out of it and control. Do you offer bikes rental for the courses? Are there different groups, according to the level of experience of the participants? 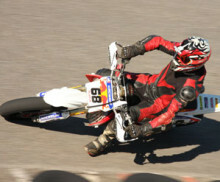 Do you accept motocross gear for the Supermoto riding courses or practices? Yes, provided the equipment is complete (for ATV included). You will need to have protections for the elbows, knees as well as a shirt front or a protective jacket. We recommend a leather suit and a back protector for bikes riders. Do you have a track for motocross?